There’s still plenty of time this year to head out for a camping Jeep trip… or two. 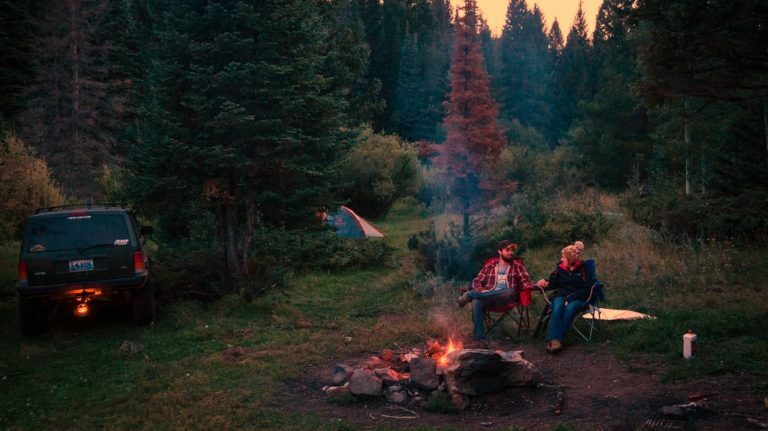 It’s the best type of camping experience there is, in my humble opinion. Whether you have an older Jeep (such as a vintage CJ-7 like me) or a more recent model, one thing’s for sure: heading out in the woods with your favorite utility vehicle can be a one-of-a-kind experience! 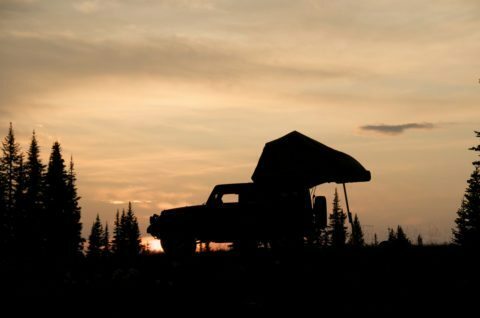 Following are some of my best tips, suggested products, and general experiences that I’ve gained from Jeep camping – or “Jamping,” as I like to call it. 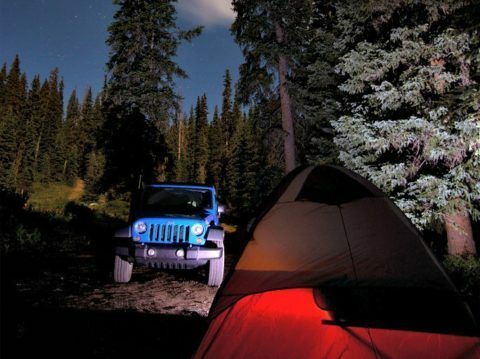 When it comes to camping with your Jeep, getting there is half the fun. With the extensive offroading capabilities that your sport utility vehicle provides, you’re able to go where other vehicles cannot. Nothing is off limits in your 4-wheel drive: logging roads, backcountry trails, beaches – you name it! Being able to get to out-of-the-way places means you’re able to explore – and stay – in wilderness areas less traveled. Isn’t that why you own a Jeep to begin with? One of my all-time favorite camping Jeep adventures involved traversing mountainous sand dunes south of Florence, Oregon and spending a memorable night under the stars in this hard-to-reach desert-ocean oasis. Had I not owned a Jeep, I wouldn’t have been able to reach this spot. The point is this: take advantage of the fact that you own a unique, high-performance vehicle and maximize this experience to the umpth degree. In addition to being able to get to remote areas, another advantageous thing about camping in a Jeep is the ability to sleep in your vehicle if you want to – or to pull a pop-up trailer for more spacious sleeping quarters. While sleeping in your Jeep is a convenient and quick option, it really works best for solo travelers due to limited space. Simply flatten the seats, lay down a sleeping pad & sleeping bag, and you’re all set. Want the ultimate in comfort when sleeping in your Jeep? Check out this inflatable Jeep air mattress! Of course, you’ll need a hitch cargo carrier for all your stuff. When it comes to pop-up trailers, there are lots of camping trailers that are budget friendly. I’ve found that the newer trailers being sold today – especially those targeted to Jeep owners – are some of the best options out there. I recently replaced my 12-year-old trailer with a new model. I’m amazed at the difference in durability – particularly the trailer’s ability to withstand any “road” surface I’ve taken it on so far. Plus, with the capacity to carry 400+ extra pounds and room for 4 adults to sleep in, I’d take a pop-up trailer versus sleeping in my rig or a standalone tent any day! 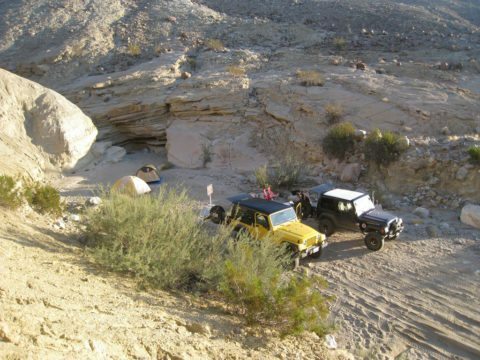 Based on my experience, a general rule of thumb with Jeep camping is that anything goes. Essentially, if it works for you – whether it’s a particular product or even a homemade modification – then go for it! A little ingenuity goes a long way. I’ve also seen an increasing number of great Jeep camping accessories on the market – from coolers that conform to your Jeep’s back seat to specialized portable stoves. 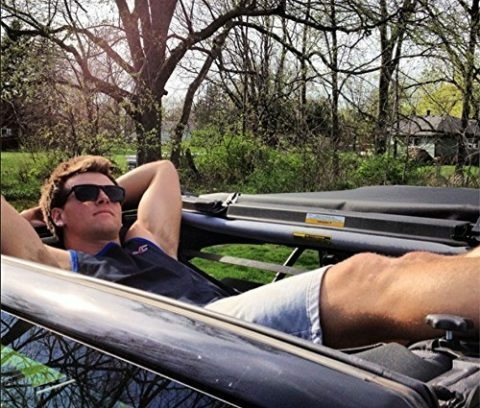 There are even hammocks that fit into the cab of your Jeep (with the top off, of course) for out-in-the-open lounging. They’re called Jammocks! And when it comes to homemade modifications, I’ve seen some really creative things out there. One particularly ingenious creation I saw was a folding table built into the back of an older Jeep Wrangler that was made out of pine, piano hinges, and a tent pole. Whenever this Jeep owner needed a table in the woods, he simply unfolded the table – which was anchored to the inside back of his rig – and voila! All of these different camping Jeep accessories are designed to make your offroad (and overnight) experience even more enjoyable… in a Jeep! So, no matter what you take with you and which wilderness destination you head to in your Jeep, just be sure to head out. Period. Trust me, Jamping is the only way to go!